Stephanie, 20-Rater. Designed by Mr. C. P. Clayton for Prince Bathyanny-Strattmann in 1892. H.S.H. is a popular member of the Royal Yacht Squadron. He is also a member and founder of the Yacht Racing Association, and, though an Austrian nobleman, he enjoys an enviable popularity in this country. The celebrated Kriemhilda, which was built for him (at that time Count Edmund Batthyany) by Michael Ratsey, marked an epoch in British yachting, which lead up to the big cutter class, including Britannia and Vigilant. 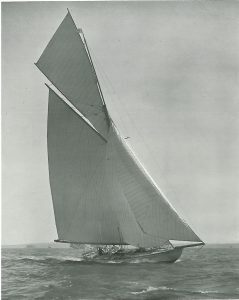 She was one of the best cutters launched from Cowes, and won many matches. The Prince also owned the Flying Cloud, one of the most celebrated schooners ever built. She figures largely in the early history of British yachting, and sailed some splendid races with Egeria, Pantomime, etc. He also owned the s.y. Blunderbuss, and was head of a syndicate which built the 20-rater Stephanie. Clubs: Royal Yacht Sailing, Royal Thames Yacht Club. Address: Claridge’s Hotel, Brook Street, W.